Plenty of spots will be rolling out the red carpet this year, and choosing where best to pop the bubby can be a tough choice. The following rundown includes some of the finest all-inclusive shindigs Utah has to offer—from salsa lessons to cowboy balls. Bolo ties and garter belts are encouraged at the University of Utah’s Marriott on New Year’s Eve. So throw on your best formal cowboy-themed costume and enjoy a drink at the old-timey saloon, take a dance lesson in the ballroom, ride the mechanical bull, nosh on some hors d’oeuvres or belt out “Okie From Muskogee” in the karaoke room. And when the magic hour approaches, you can clink your complimentary Champagne as you watch the seven-story atrium ball drop. Start off the new year by finally taking that salsa class you’ve always wanted to try. DF Dance Studio is offering two party options: a 21-and-over dinner gala with live jazz bands, a full bar and a chocolate fountain, followed by Party No. 2: a salsa and bachata class, with karaoke, a game room and, of course, plenty of salsa dancing. The class is included in the dinner price, or you can come after the meal if you feel like just dancing. Expect a midnight Champagne toast and dancing till 2 a.m. 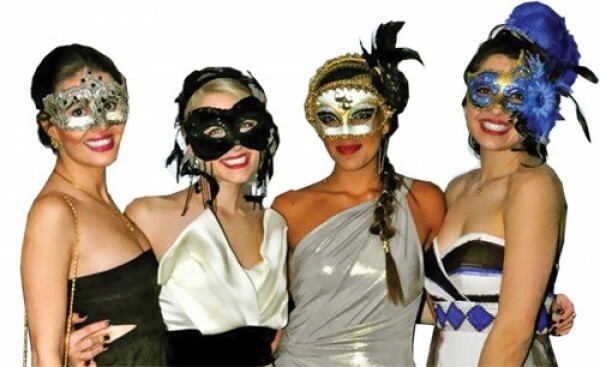 If you’d like to escape the downtown frenzy, Zermatt Resort in Midway will be taking it up a notch with its annual New Year’s Eve Masquerade Party. Expect a full spread of aged steaks and fresh seafood from Z’s Steak & Chop Haus, live music by jazzy swing band Take 5, a free photo booth and a Champagne toast and ball drop at midnight. Lodging packages are also available so you can take full advantage of the holiday. ATDmovement is taking over Infinity Event Center for the night. Expect a 75,000-watt sound system, Champagne showers, flip cup and beer pong tournaments, a photo booth, a laser show, a balloon drop with $5,000 up for grabs, hookah service and music by DJ Lishus, DJ Fresh(NESS), DJ Jello and DJ Delmaggio. The event is for ages 18 and up, with a 21-and-over beer garden. The Greek Knights are throwing a Great Gatsby/Roaring ’20s-themed party at The Gateway’s Grand Hall. Entertainment includes music from DJ Bentley and DJ Jpan, plus a visual show from VJ Mr. Zig Zag. Appetizers, Champagne, a photobooth and tons of NYE swag are all part of this black-tie event. VIP tickets that include bottle service and other party frills are also available. For the biggest 18-and-under dance party this side of the Rockies, look no further than The Complex. Nothing but the best underage bells and whistles will be available, including a red-carpet photo booth, a live NYC ball-drop feed, a resolution wall, a balloon drop and music from electro-spinning DJ Marcus Wing and special guests. You’ll want to bust out your fanciest formalwear for this black-tie shindig at the Red Lion Hotel in downtown Salt Lake City. Big Easy Entertainment is putting on this 21-and-over masquerade ball, which includes cocktail hour, dinner and live entertainment by The Changing Lanes Band, The Decade Divas, Deejay Stario and a stand-up comedian.